I decided to continue with my confetti theme, only this time with prints and solids combined. Above picture is of two blocks combined. Use your scraps. I started piecing bits of scraps into strips. Made them between 2 1/2" to 3" wide. The blocks measures 13" X 13" and 13" X 20". I like the linear look of this so far. 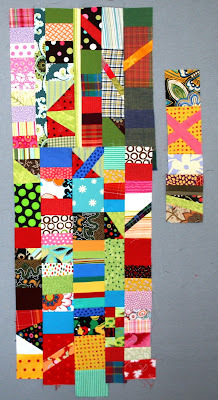 So I request that you stay with making long strips and piecing them together to make a block. Please use clean colors and small prints. I really like to see prints.. if you don't have them you are free to use batiks.. But please... only if you must! Grey and dull colors are great in small dozes. Dots, solids, plaids, stripes, mini prints in any color will be wonderful! I would love it if your block has atleast one half square triangle and couple of sticks on an angle. 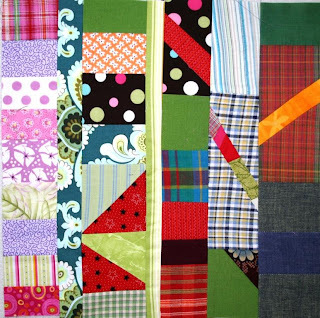 I think eventually they would look great sprinkled around the entire quilt. Feel free to use thin strips in between the columns if you have to. Any size is a good size as long as it is at least 13" long. 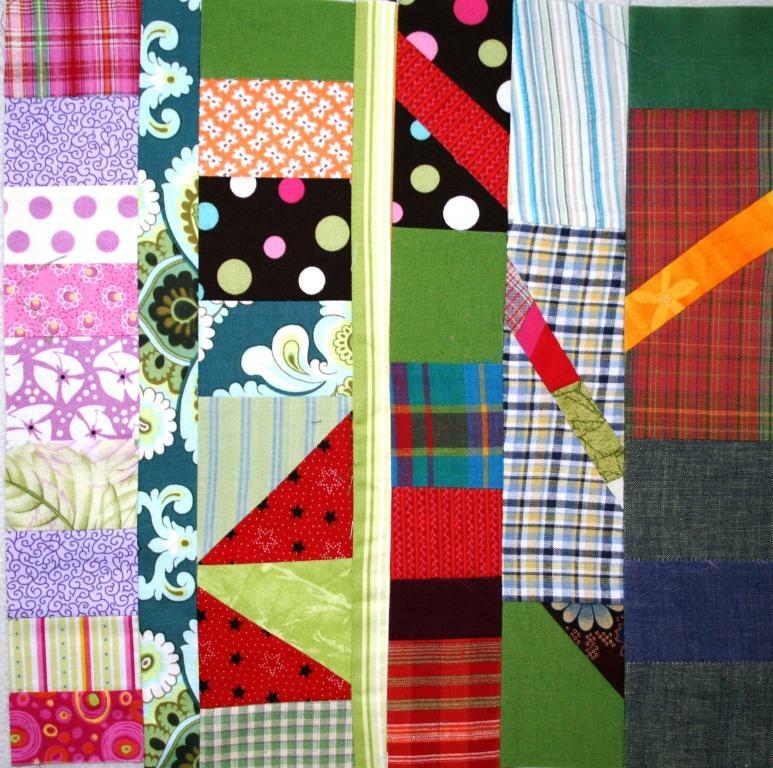 This is going to be a wonderful and colorful quilt. Can't wait to see everyone's blocks as they get added. Oh, how exciting this one is. I need to sit and play for a while tonight! Eek!! I'll be struggling to stay away from batiks...about 90% of my stash...but I'll try! Please use whatever you have. Really! I said that only because I did not want too many batiks in my quilt. I am really okay with a few in it. Like the linear idea, Sujata. My lucky number is 13, so I am happy to give it a whirl.